Giving Hope Lawn Management offers professional foundation water proofing services. We offer free consultations and quotes. To get your free quote call us today. Everyone knows that poured concrete is one of the most durable building materials available. But even something as strong as cement can encounter issues. In fact, concrete slabs easily crumble after prolonged exposure to moisture. 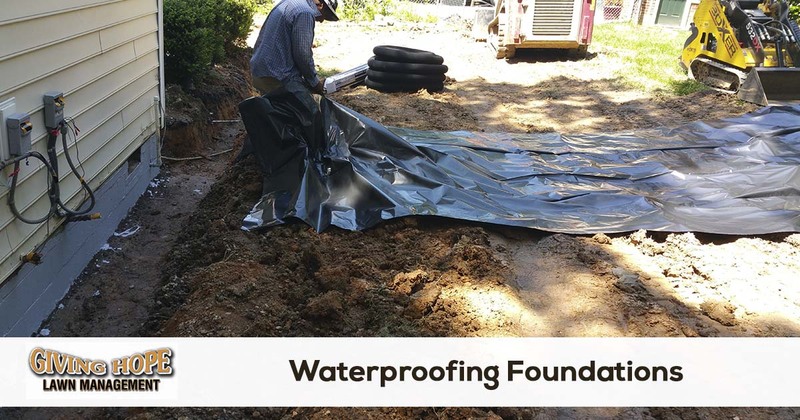 Because of the extensive repairs that require, many are concerned with foundation water proofing services. When you need better protection for your home, you need professional services that keep your concrete dry. When you call Giving Hope Lawn Management, we provide the best defense for your home. We offer a specialized coating that prevents moisture from seeping into the slab. That way you don’t have to worry about unseen problems from occurring! Call today if you are concerned with your foundation’s performance. We ensure the best in home protection services! There’s a couple of different ways that we can keep moisture away from your foundation. Through proper drainage and a protective barrier, you never have to concern yourself with future issues later. The first thing is determining whether or not your suspicions are correct. If we do discover signs of moisture damage, we know it’s time to get to work! Next is to carefully trench out around the foundation so that we can promote better yard drainage. At this time, we may need to install piping to move more water. Once that’s completed, we cover your home’s slab in a protective coating. That creates a barrier that keeps moisture away from the porous surface of the concrete. In no time, your home will remain protected from pooling water and flooded yards. Your house’s slab will stay in peak form for many years to come! When you need the best treatment possible for your foundation, you need us to assist you. Choose the team with the experience you can trust today! Not every building will require additional water proofing efforts. But the homes and businesses that do can’t get ignored! When your foundation starts to crack and crumble, it can cause the structure to fall in on itself. Early signs of danger are structural cracks, slanted floors, and doors and windows that stop closing correctly. And while a damaged foundation can get repaired, it’s an incredibly challenging process. Instead, better protection from water is what your home or office needs! Some residents may think that they can rely on damp proofing, but that only protects against soil moisture. Instead, our durable concrete coating outperforms any other method! Make sure your home stays safe from too much moisture. We provide the level of defense you need every day! You deserve the best protection possible from everything nature throws at your home. When your foundation requires waterproofing services, be sure to call Giving Hope Lawn Management. We offer affordable services and faster response times. When you need better water protection today, you need us to service your home! Ready to have your foundation water proofed or just need a quote? We make it easy to get a free quote and schedule your service. All you need to do is request a quote online or give us a call today!